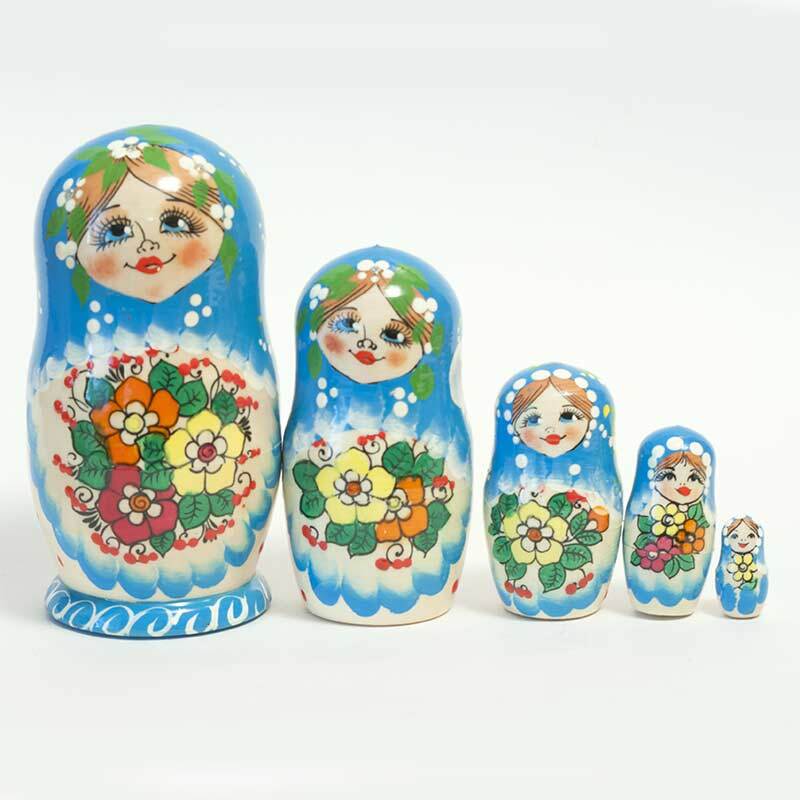 Russian matryoshka dolls became popular all over the world during last 20-30 years although it has longer history. They say that the first nesting doll appeared in 1892 in the art workshop in the estate Abramtsevo which was located not far from Moscow. It worth to say that idea of a wood doll which consists of some pieces, each piece is hollow inside so each next smaller wood can be put inside the previous, larger, doll came from Japan, somebody brought such cute toy from his trip to Japan. 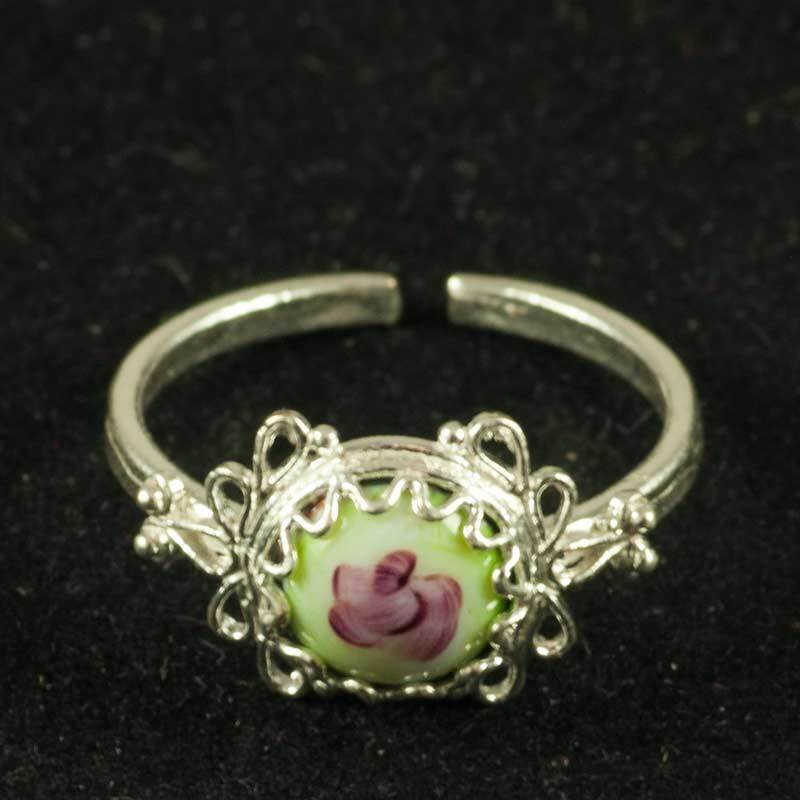 It is well know that Japanese artisans can make very delicate things which need much skill and patient. 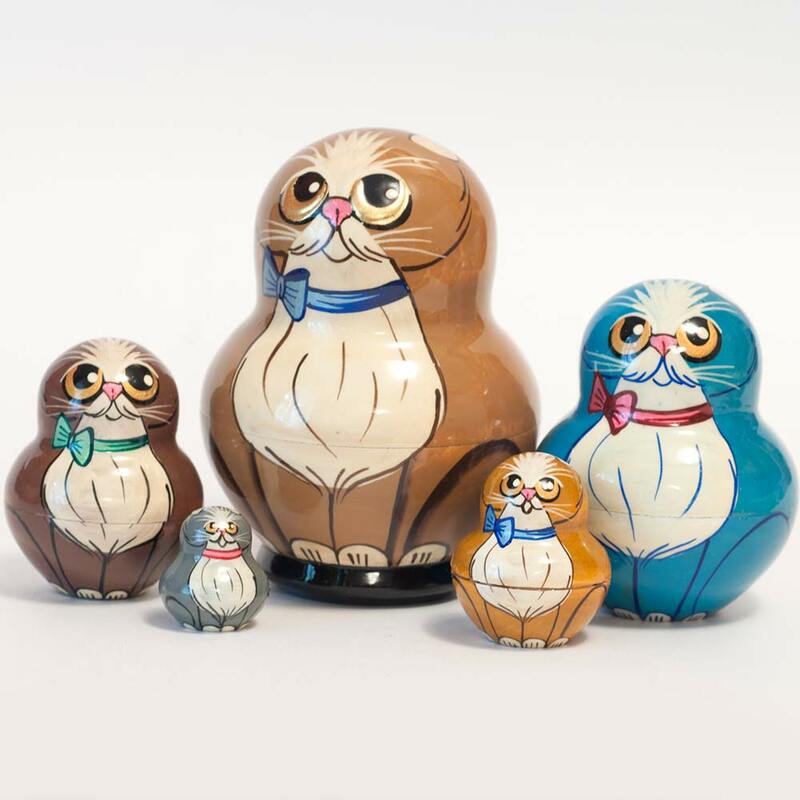 So when Russian artisans saw that Japanese wooden nesting doll they felt a kind of competition spirit and set right away to make their own nesting doll. 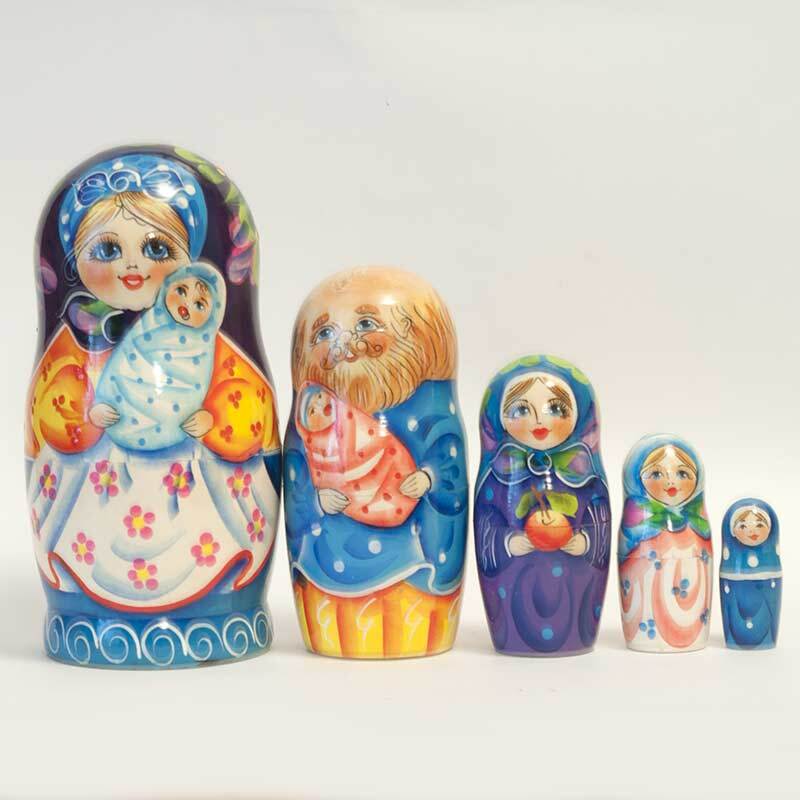 We are proud to say that our Russian crafters could repeat the toy and even more – they made their own shape which is quite close to the shape of the modern Russian matryoshka doll. 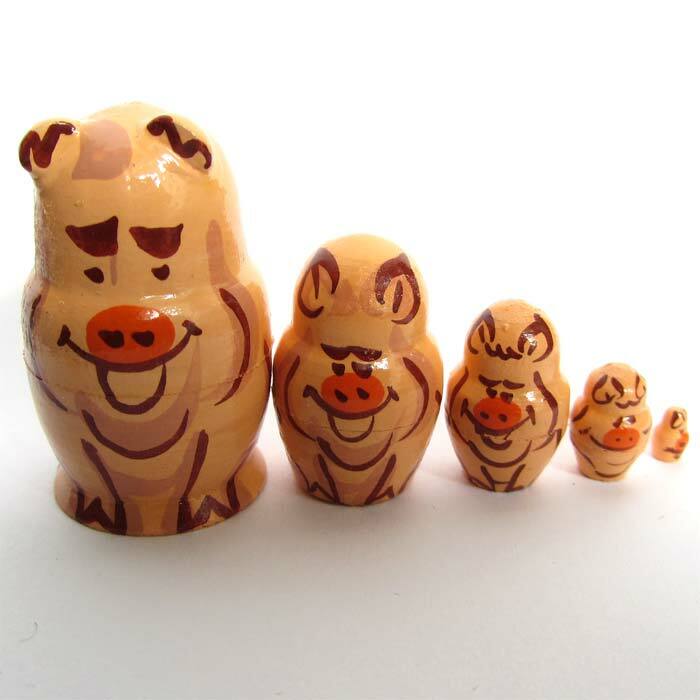 The next step was not so complicate – to make own design and to paint the nesting doll. The idea what to paint on the wood dolls came into mind quite fast – the artist decided to paint the whole Russian peasant family – mother and her children. 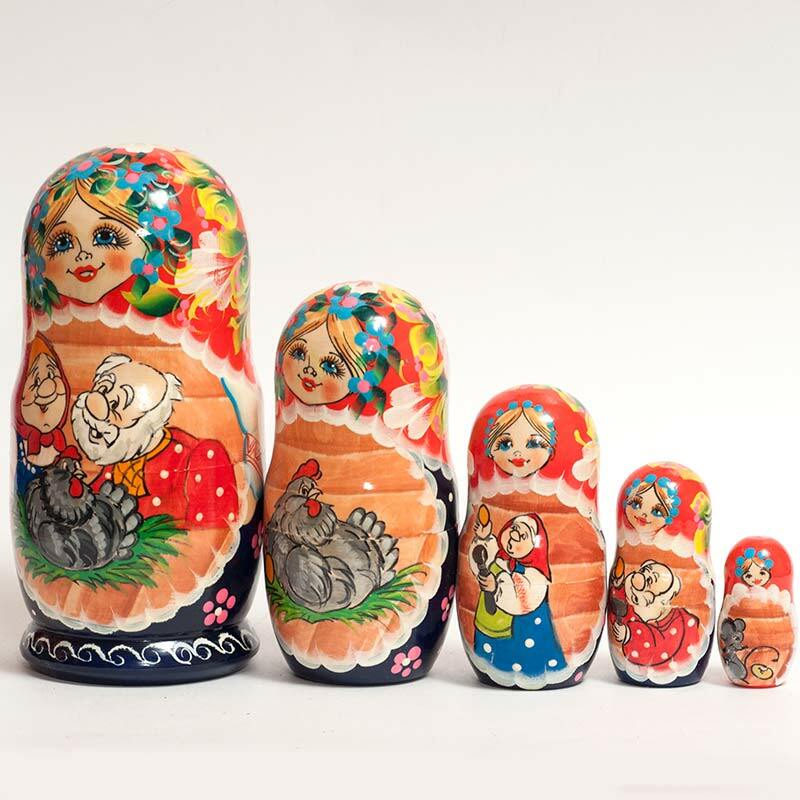 The first Russian nesting dolls consisted of 8 pieces and we can not say the reason why 8, not 7 or 9, we think that there is not symbolism in it, that was just a matter of a case. Now more common are 3, 5, 7 pieces sets of nesting dolls. Although matryoshka dolls were produced in Russia and then in the USSR all this time it became most popular after 80-s of the last century. 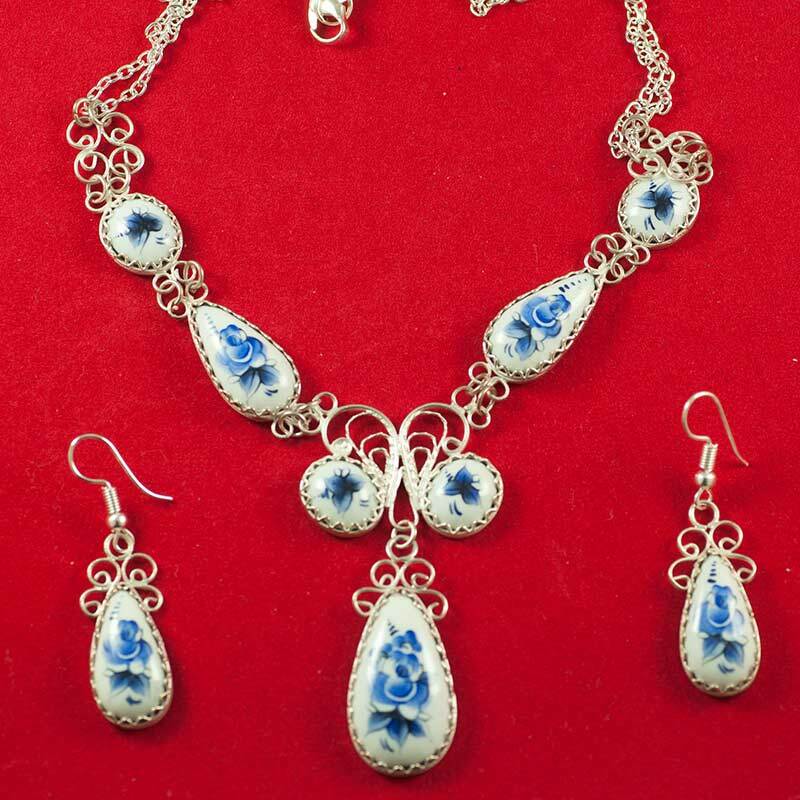 We consider that the reason of it is the fact that since 80-s Russia became more open for other part of the world and people from other countries who came to Russia as tourists or on business and they could to be acquainted with Russian traditional crafts and arts. The secrete is why among many different traditional products the nesting doll became most popular. Forgive us that we do not know the exact reason of matryoshka’s popularity but you can tell us your own version. The Russian nesting doll became well know and popular all over the world. Now the Russian name of this cute toy “matryoshka” came even into the Oxford English Dictionary. It worth to say that not many people used to read Oxford English Dictionary and more popular is online Wikipedia. There is a long article which is devoted to matryoshka, it gives some basic information about history and style of Russian matryoshka. There is one point about matryoshka which should be explained in more details – this is explanation about name of this wooden toy. 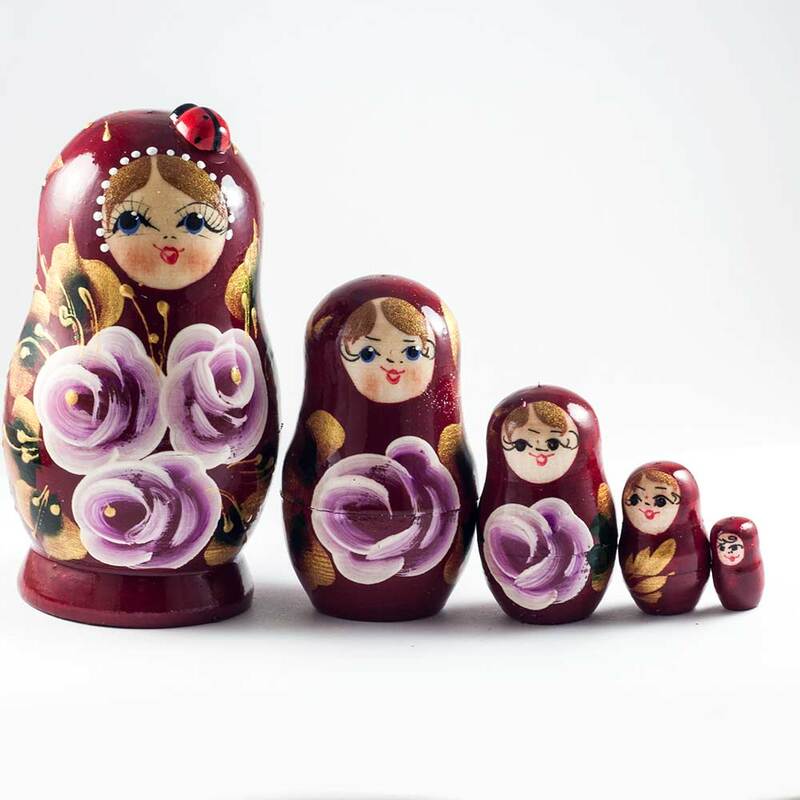 In English “matryoshka” also is called as “nesting doll”, “nested doll”, “babushka”, “stacking doll”, “stackable doll” and just “Russian doll”. Here we would try to clear this point and to explain how to call properly this funny dolls. Name “Matryoshka” is the affectionate diminutive form of old Russian woman name Matryona – this was a common name in Russian villages. The first Russian nesting doll described a peasant young woman in typical for that time costume. It was a pure accident that somebody called Matryona the country girl which was painted on the wooden toy. 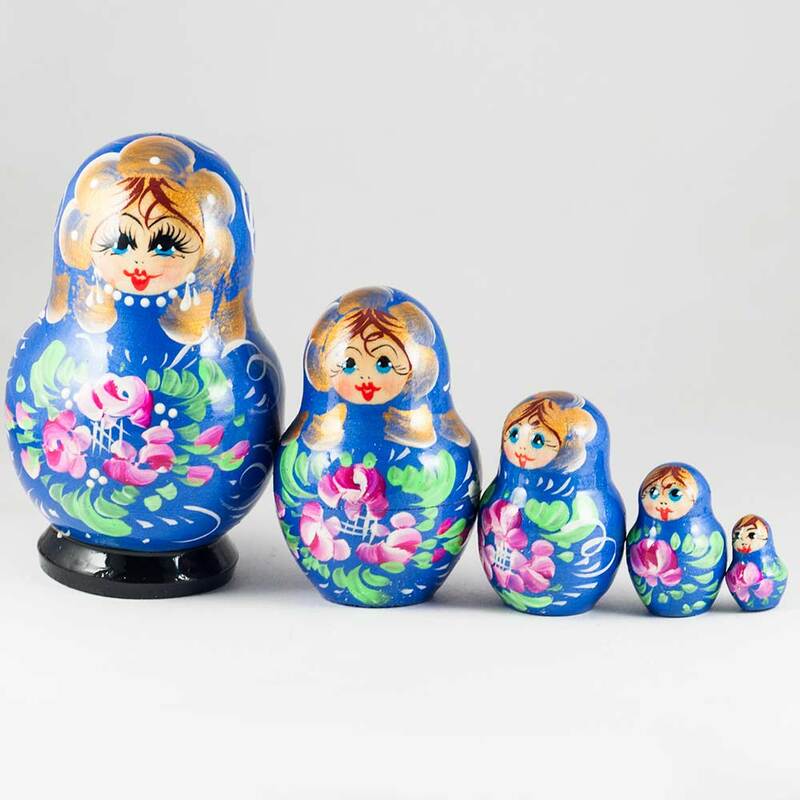 There are many speculations about sacred meaning of the name of a nesting doll and meaning of a nesting doll itself but I dare to disappoint you – there is no special meaning, this is just matter of chance. It is not out of place to mention here that the word “matryoshka” can be written as “matrioshka”, “matreshka”, “matrushka” and even “matushka”. 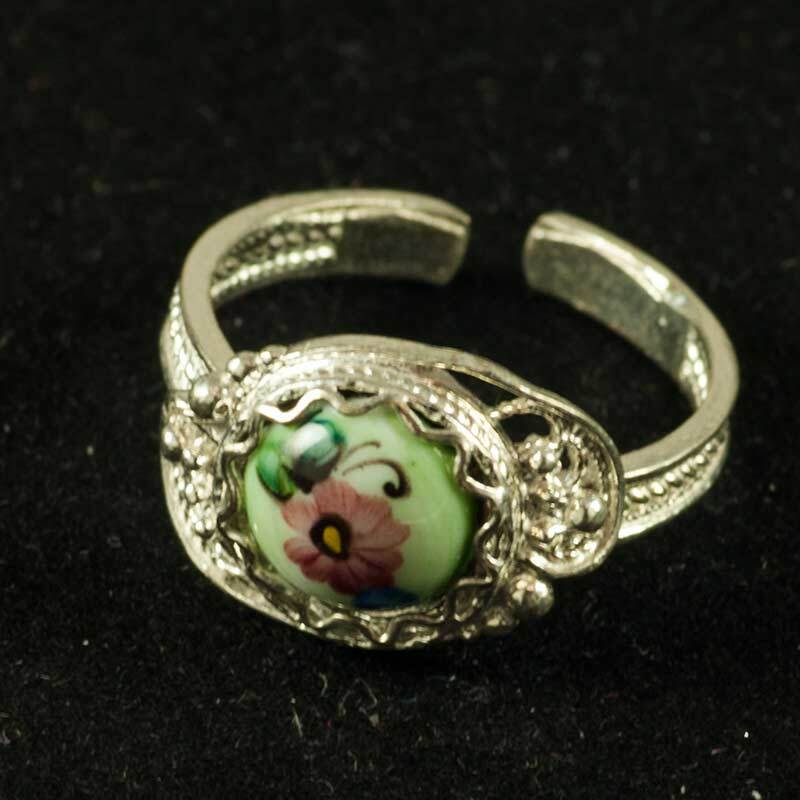 The variant “matushka” is Finnish one, people from Finland call so Russian girls and women. This name is used less often than “nesting doll” and if I am allowed to express my personal opinion this name is not correct. 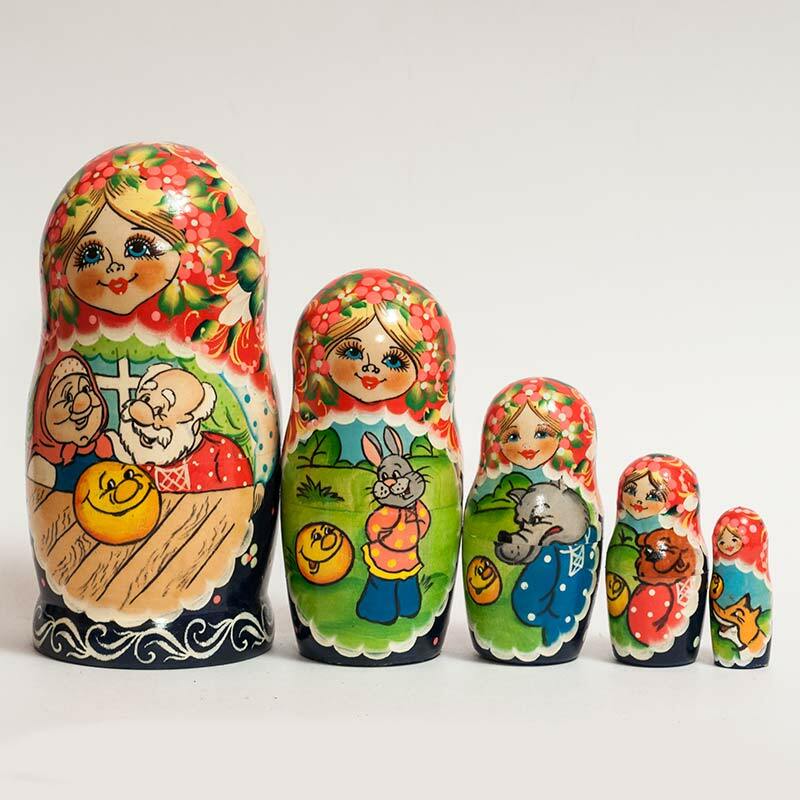 “Stacking” means that things are on each other in a pile while each matryoshka doll goes into other empty doll from the set (except the largest, the first doll). This is the most interesting variant of the name. Babushka in Russian language means “grandmother”, “granny”, “grandma”. Let me to present my own version of its derivation. In past when tourists bought matryoshkas at the street markets of Moscow or Saint-Petersburg they told to customers a short story about they toy. 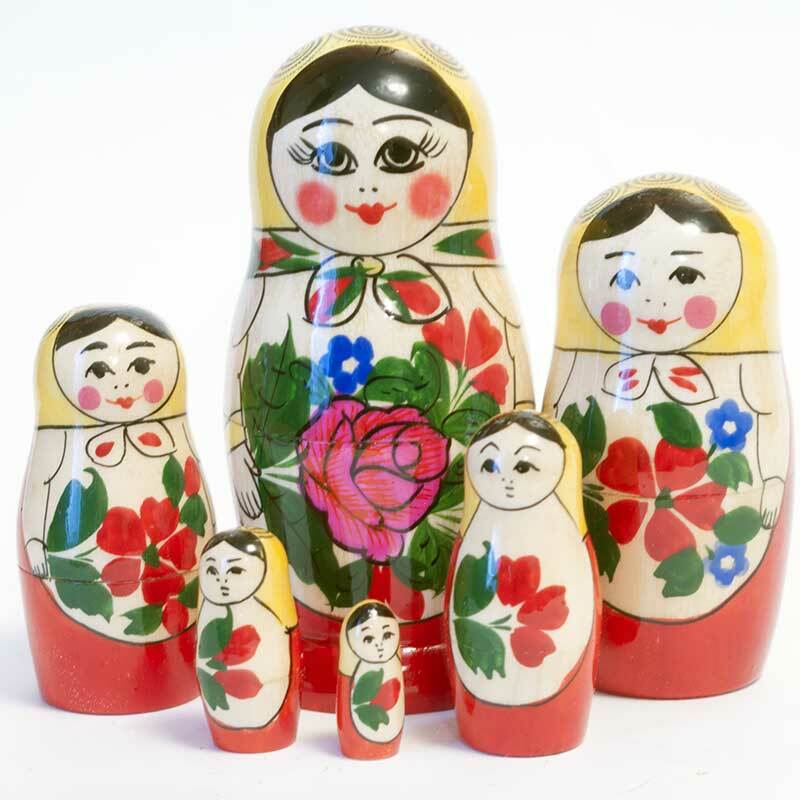 They told that the nesting doll set consisted of the whole family – babushka, mother, daughters. 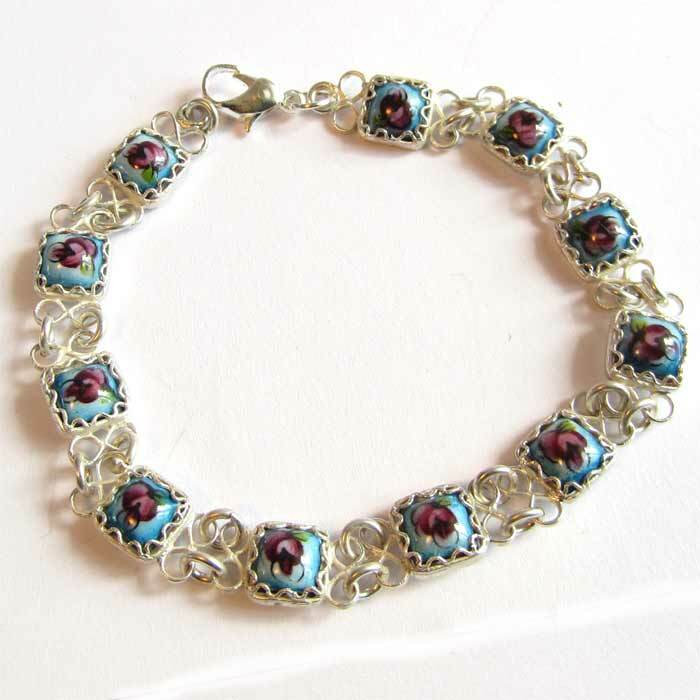 “Oh, babushka, nice!” – replied the customers and bought the souvenir. The “babushka” word is easy to pronounce in main part of languages so it was accepted by people from different countries. 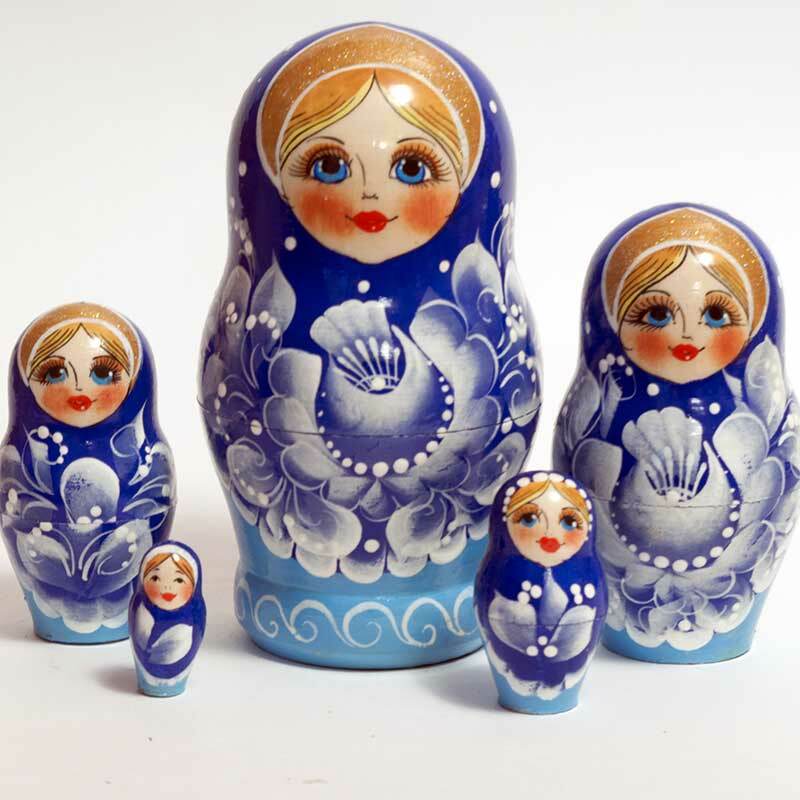 The easiest way to use phrase “Russian dolls” if you forgot the right word. This is the same as we often call Kokeshi dolls just “Japanese dolls”. Although this is not correct if to be strict but people often do it. There is some confusion with it because of French film “Russian dolls” (original name “Les poupées russes” – it is well known in Russia because of popular actress Audrey Tautou) . 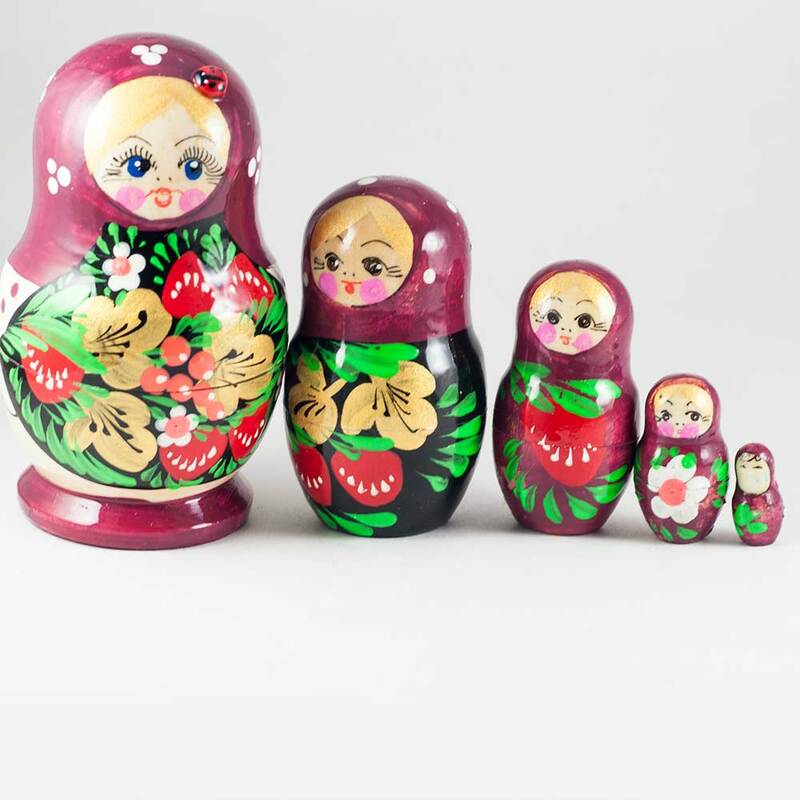 But if you want to find where to buy matryoshka dolls just type into the search field of your favorite search engine and you get list of sites with offer nesting dolls or tell about the movie “Russian dolls”. 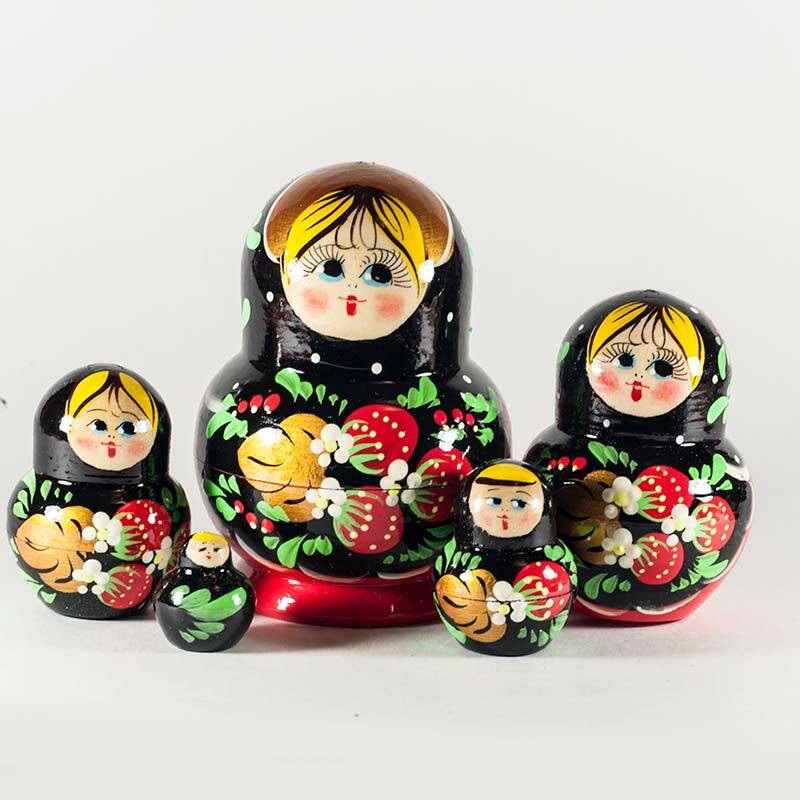 We would not tell you a big secret if we inform that quality of Russian matryoshka dolls greatly depends on how well the wooden blank nesting doll is made. 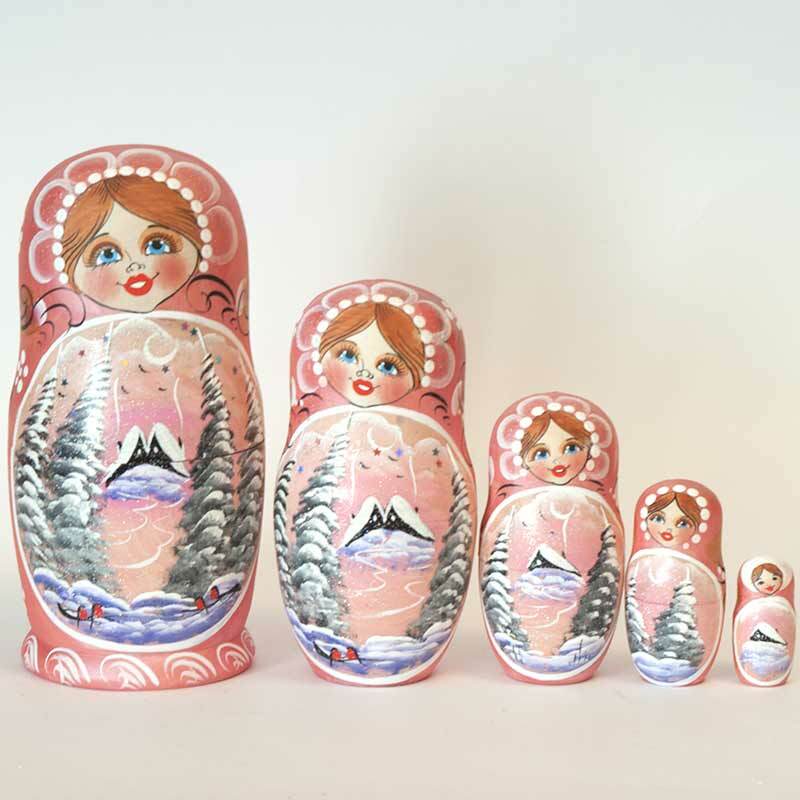 The artists who paint these stacking dolls do not make blank dolls, they get ready sets of matryoshka dolls. Who does make the blank unpainted nested dolls? In most cases they are unknown, they are after the curtain. 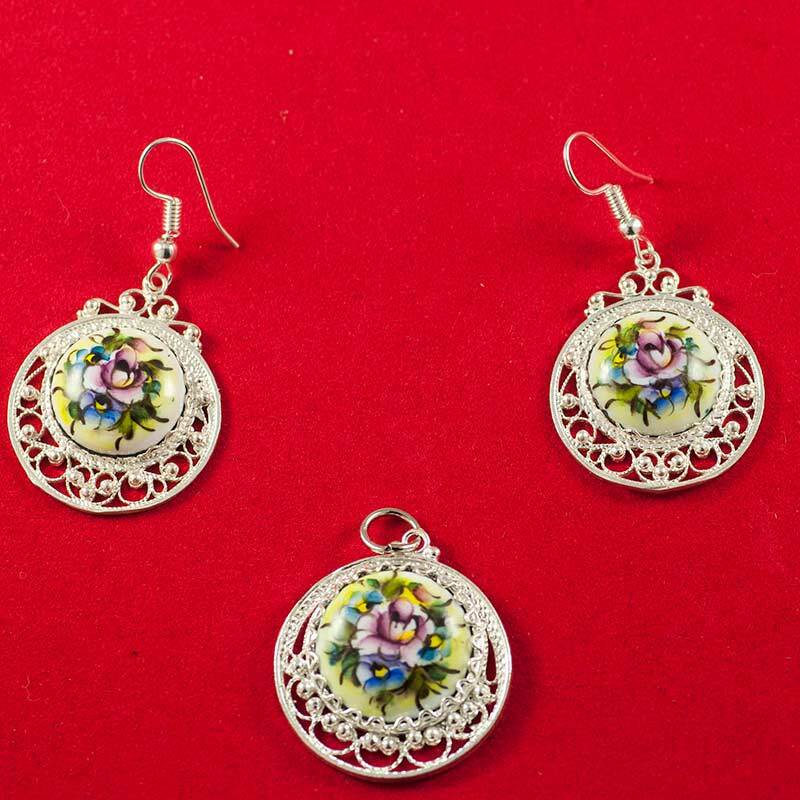 These are modest artisans of different ages from the villages which locate in deep Russia, mainly in Nizhniy Novgorod region. 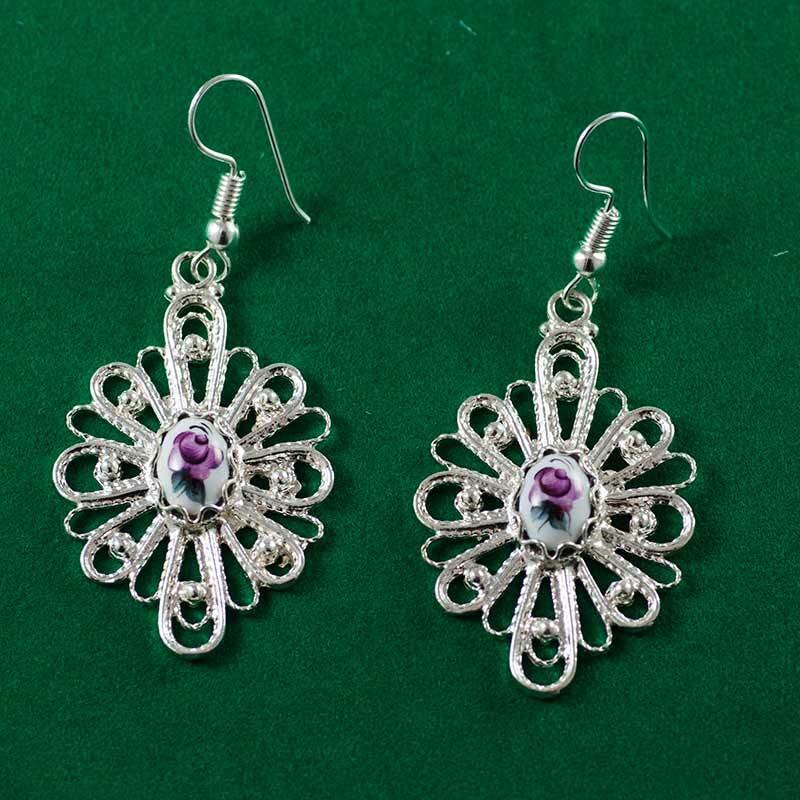 We bet that the main part of people will say that the most important person who is involved into the process of matryoshka making is an artist. Partly this is correct but artist’s success greatly depends on the quality of the blank doll. Only skilled artisans can make good quality matryoshka dolls, they start learning how to make since childhood. When a boy is 7-8 years old he already starts to work at lathe some simple wood items like eggs. Then with time when a young wood turner gets some experience he starts to turn small dolls which are not opened. In the age of 16-18 boys start to work as professional wood turners. The base of the good quality wood nesting doll is quality of timber which is used. The best wood for nesting dolls is soft and light lime tree wood. But getting of straight logs is not enough, this is necessary to prepare them properly for drying and then dry in proper place and during proper time. The sicker log is the more time it needs to be dried. The logs which go for making big 15-20 pieces matryoshka sets should be dried during 8-10 years. 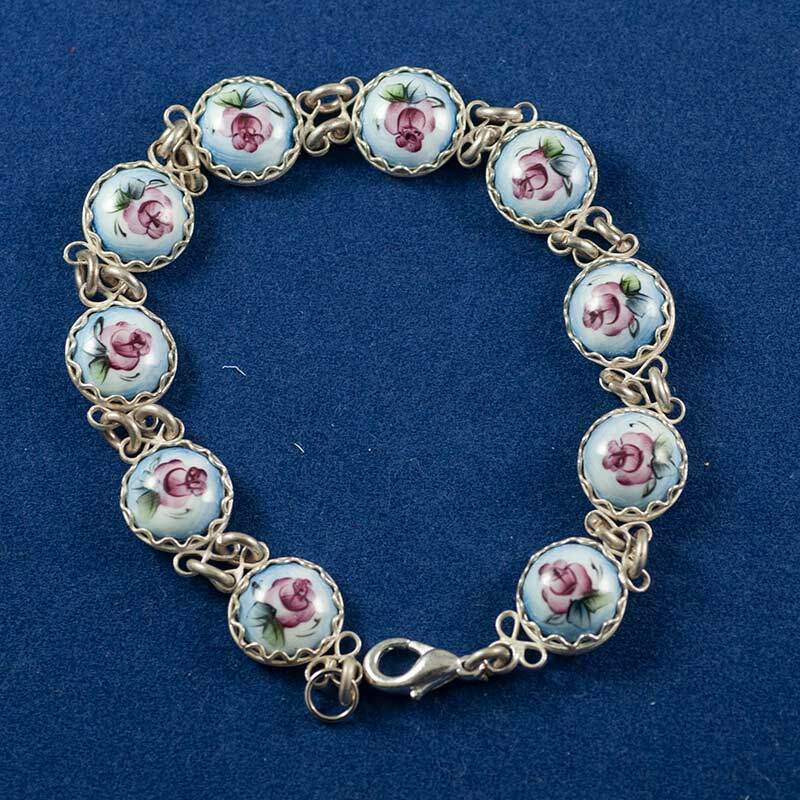 So each time when you take in your hands a nesting doll recollect that it is result of work of unknown for you artisan from distant village in deep Russia. Different kinds of paints can be used to paint a nesting doll. The most common are gouache paints which are inexpensive, affordable in any place and simple to use. More expensive are tempera paints, they are brighter than gouache paints and this is simpler to use them. Both these paints are non-toxic so the nesting dolls which are painted with these paints are not dangerous for children in case if they damage to lacquer protective layer. 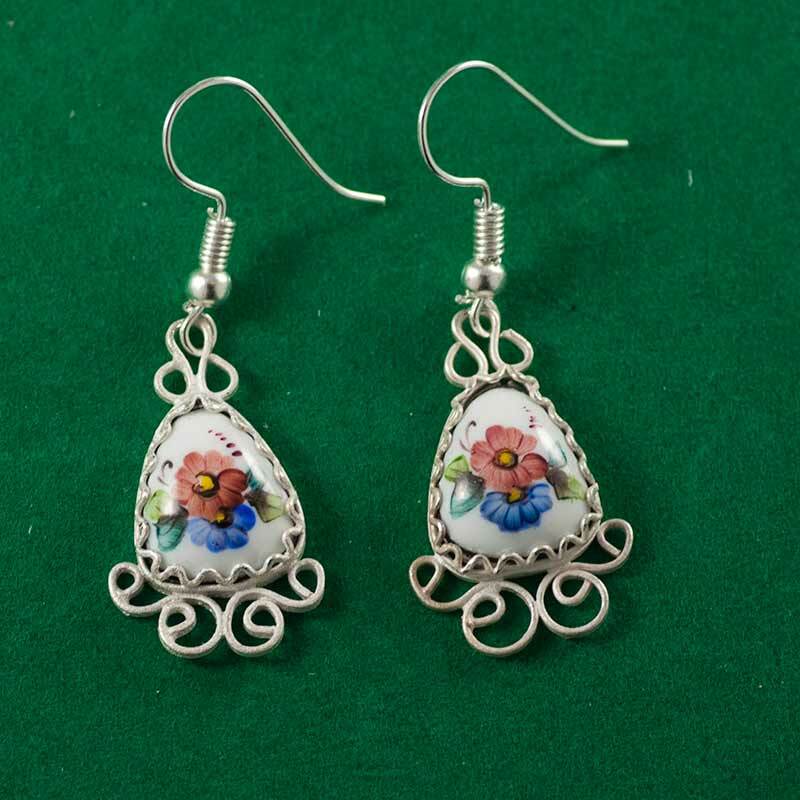 Some more experienced are used water colors, this is much harder to work with them as it is not possible to correct painting when mistake may happen in opposite to painting of matryoshka by gouache or tempera paints. Other important thing for painting by water colors is the perfect quality of the blank nesting doll surface – it should be clean and smooth because water color paints are transparent or semi-transparent of the wood base and its texture is visible. But if such matryoshkas which are painted with water colors are more attractive, they look festive and light. Other important thing in process of nesting doll painting is protection of ready painting with lacquer. 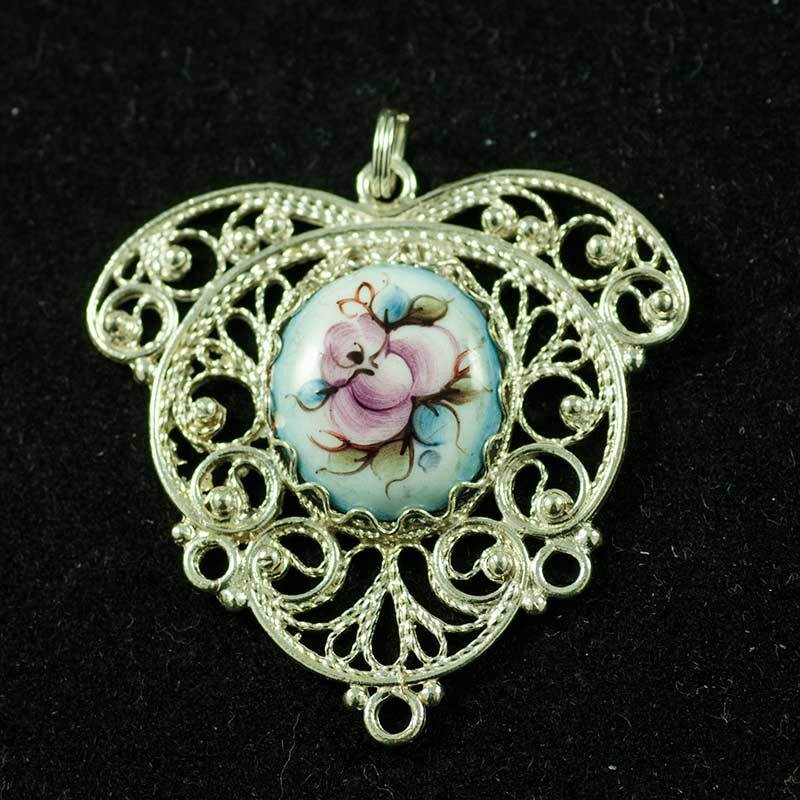 In most cases glossy lacquer is used but sometimes artists use mat lacquer, this is part of art design and idea. To protect the nesting doll this is necessary to put some layers for lacquer and each layer should be well dried. Finishing with lacquer of the ready matryoshka doll is not so simple thing – the layer should be thin without any lacquer excess. 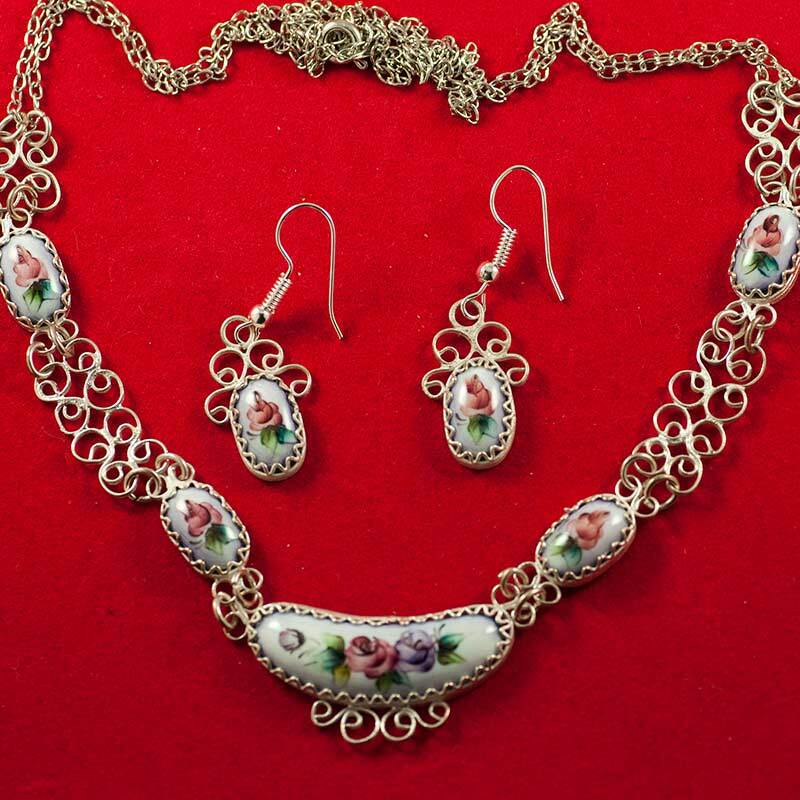 Often nesting dolls are coated with lacquer by hands – an artist put hand into lacquer and then rub in surface. 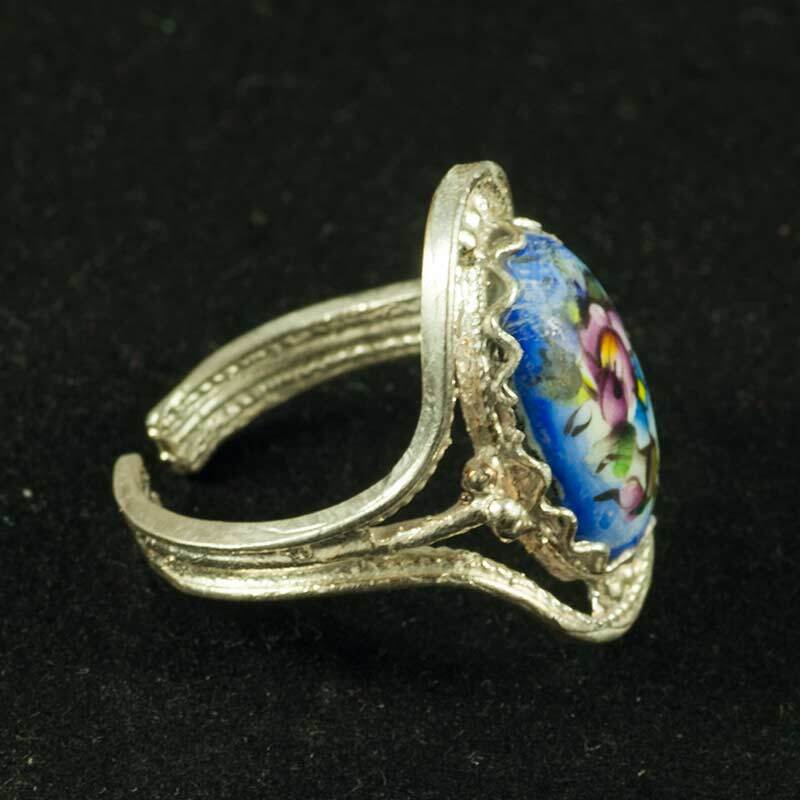 In this case the thickness of lacquer layer is controlled tactilely. 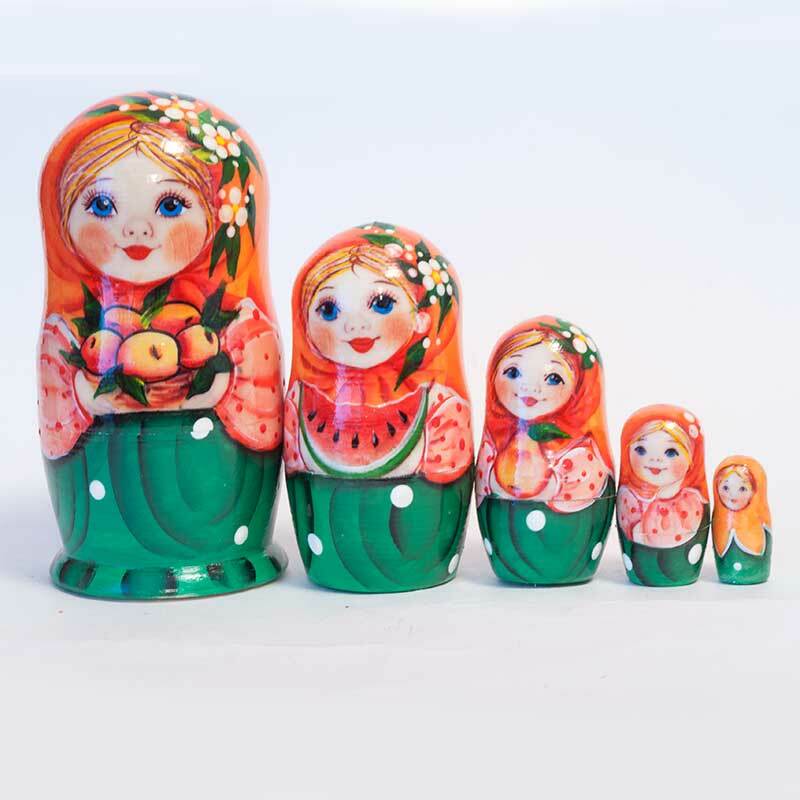 During its more than 100 years old history the Russian matryoshka doll had not smooth development. 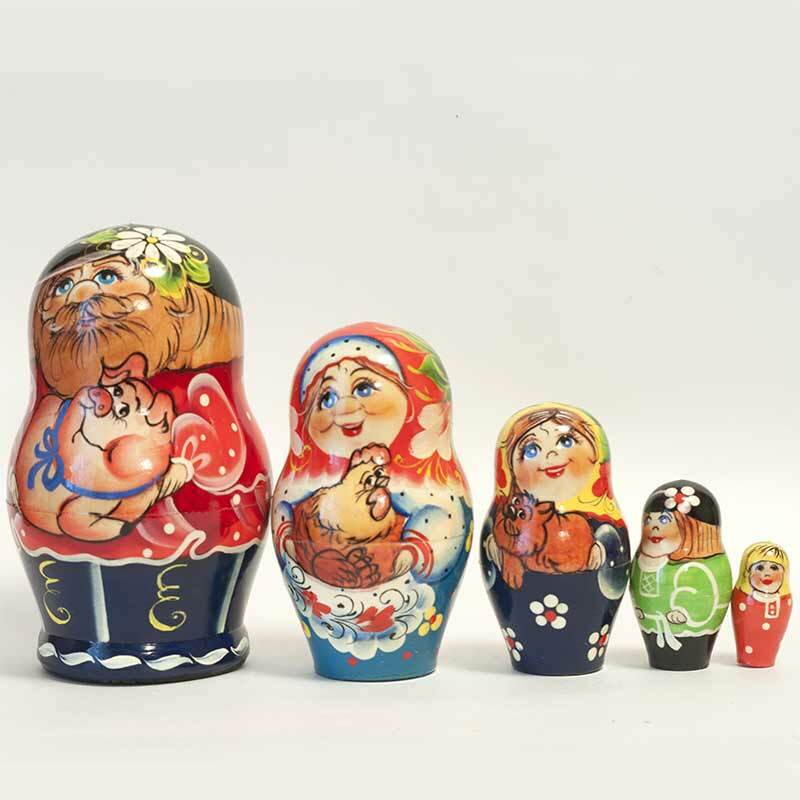 Thus in the very beginning the Russian matryoshka attracted much interest of customers in Russia and abroad and attention of artists which created different kinds of Russian dolls. Then in period of Soviet time there were more important economical and cultural tasks so this cute wood toy was slightly forgotten and only in villages like Semionov, Polhovskiy Maidan and Sergievt Posad artisans continued to produce matryoshka dolls in small amounts. 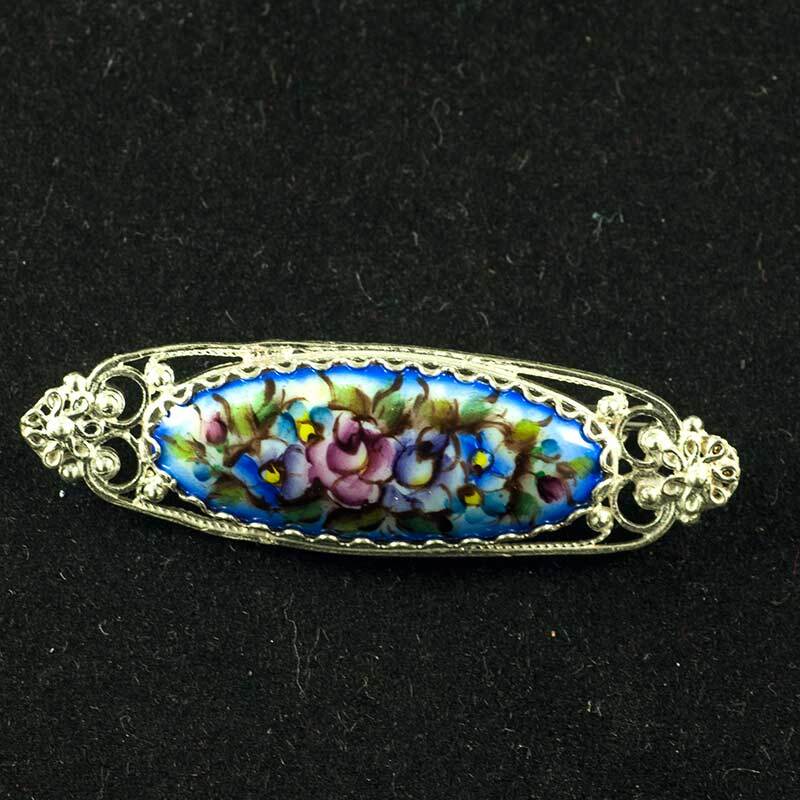 Though it is necessary to confess than in 60-s the Soviet government decided to develop traditional art crafts so together with applied art articles like painted metal trays, wooden painted tableware, lacquer miniature boxes and others matryoshka was manufactured in different regions at factories and at small art shops. 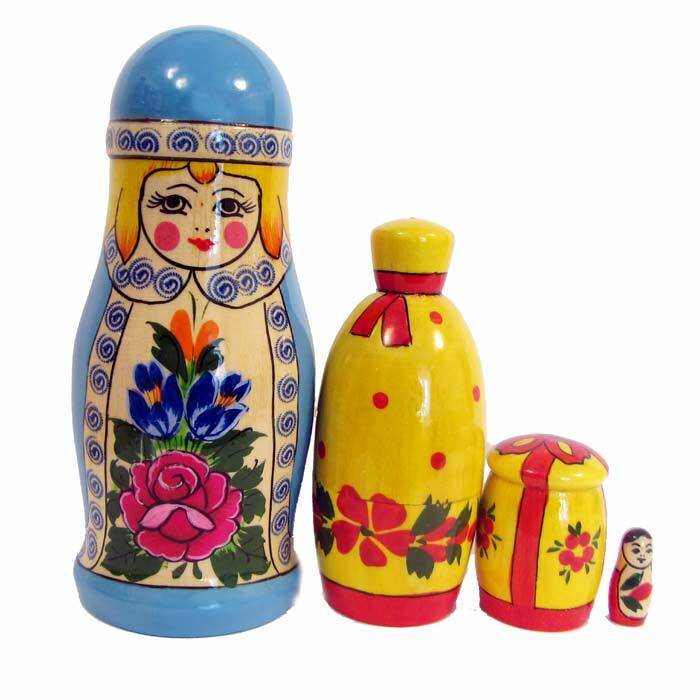 To say the truth those nesting dolls were not so colorful and interesting in comparison with first matryoshkas or present time dolls. 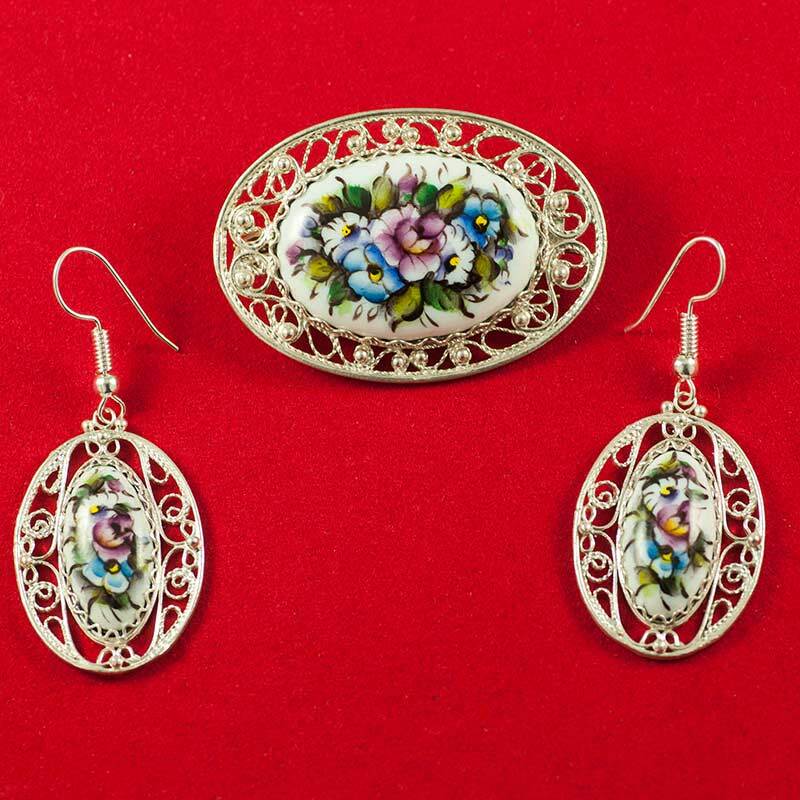 The real renaissance of Russian matryoshka started in the end on 80-s – beginning of 90-s when tourists and businessmen from all the world came to Russia and generated effective demand. 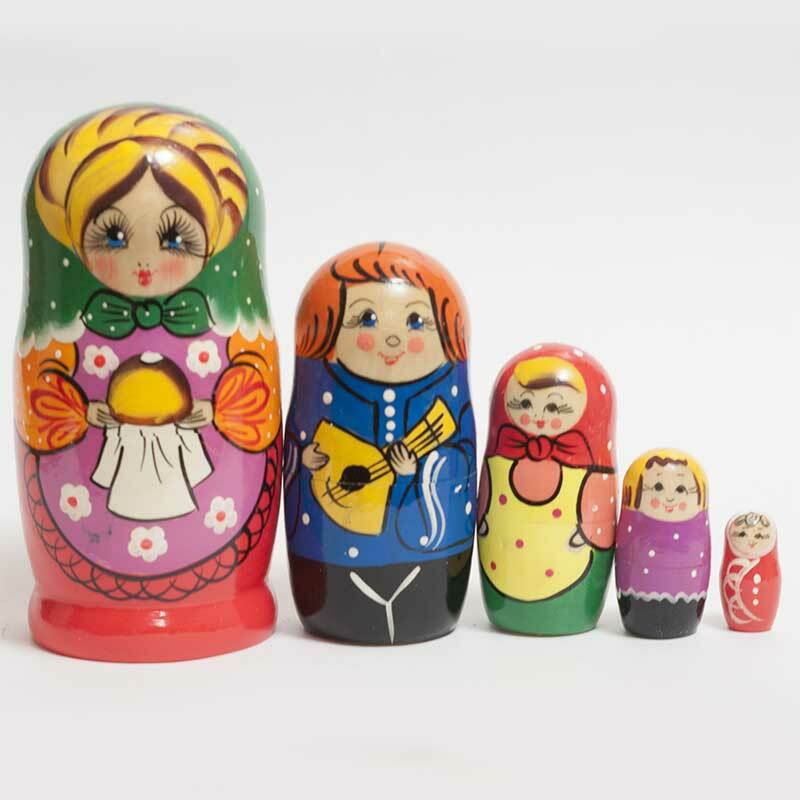 The nesting dolls created in that period of time were often real pieces of art - this is because often professional artists designed and painted matryoshkas, often their were made in one copy only. 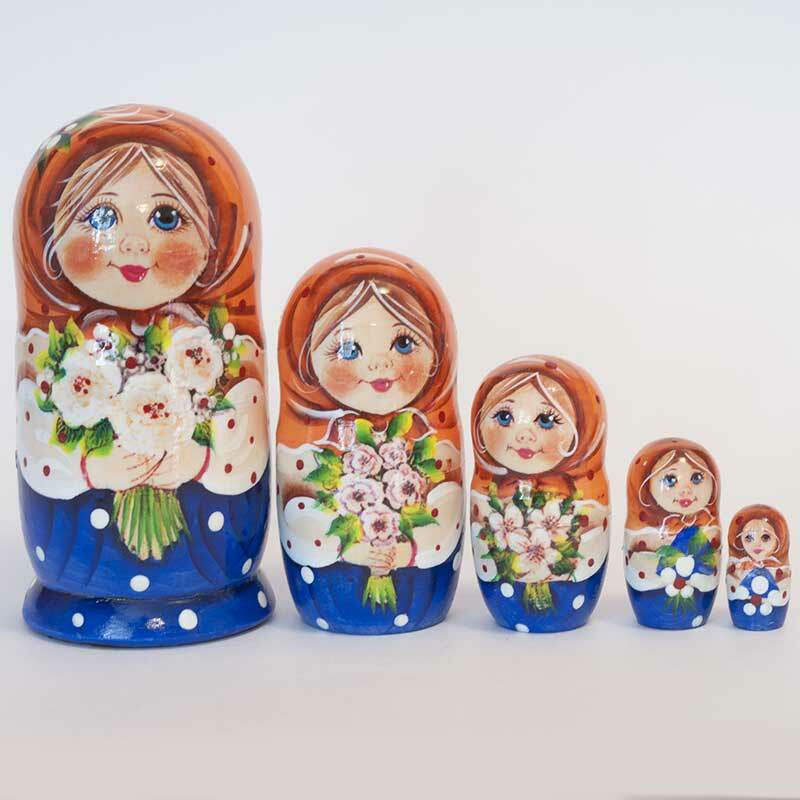 We worked in that time with nesting dolls and we remember many collectors who we supplied with high quality stacking dolls. We have to confess that at present time this is much harder to get nesting dolls which are painted at high art level because less and less good artists are involved in making matroyshka dolls. 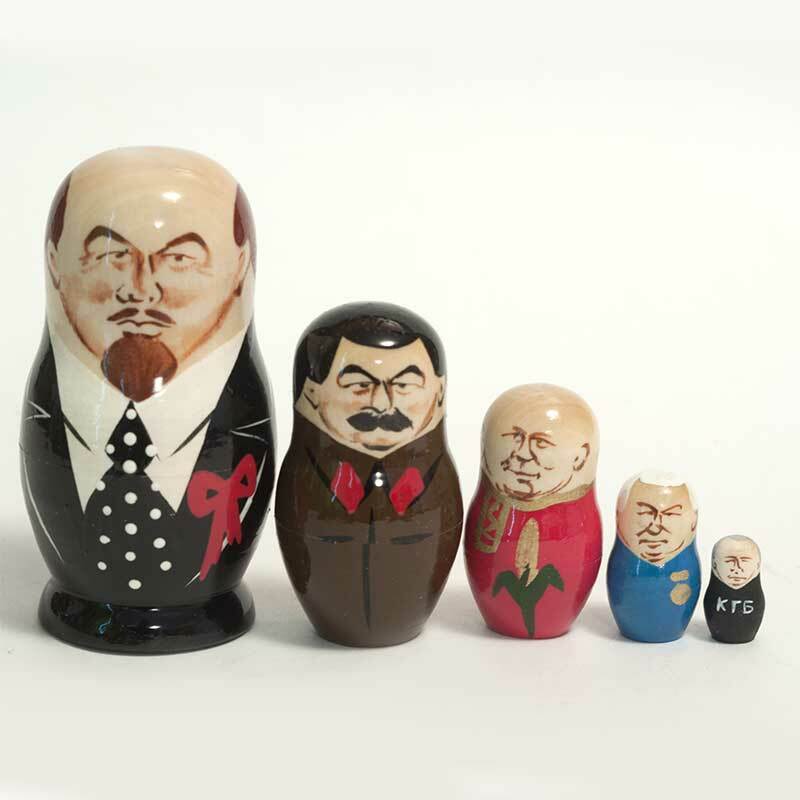 We dare to tell even more – sometimes we can meet nesting dolls which are not painted by hand but are decorated with ready sticking films, especially the nesting dolls which describe political leader, pop singers, musicians. So be careful when you buy such nesting dolls. 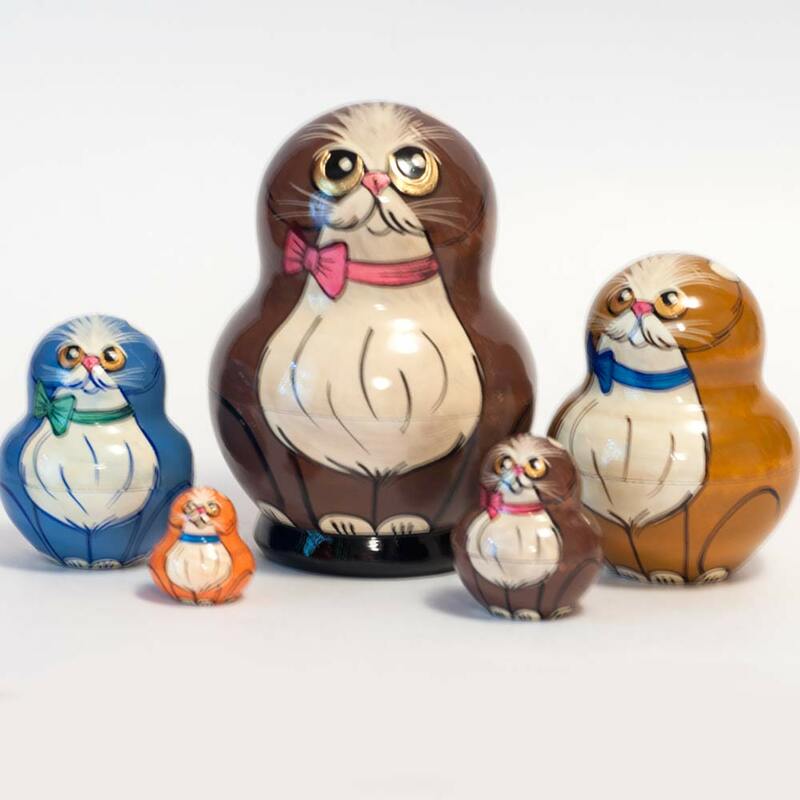 We want to assure you that all nesting dolls which are displayed at our site and hand made and hand painted and all of them are my in Russia.